Something that was hugely satisfying about the race was getting payoff for all the preparation. The conversations and advice about recuperation and nutrition that meant that I could keep consistent time throughout, and on demand do a flying lap on demand, even 22hours into the event (in support of a London team mate in contention for the podium). The drills and practice which meant that even when the lungs where bursting, the legs and back were aching, the technique was still there and still efficient. The understanding of skating dynamics so could adapt cadence and push throughout the lap. But what really made the event was I was doing that with a group of 70 or so London skaters that had shared my preparation journey, and were enjoying their own races. Last weekend was my 5th attempt at Le Mans and my 4th attempt at organising a team.I organise the London Wheelers team and we never go to achieve a great finishing position or to break any records. We do it for fun, and that’s hopefully represented in the smiles in our photos. Some things never change; for example I know that every year my lap times get slower because I do nothing to improve my technique in between events. 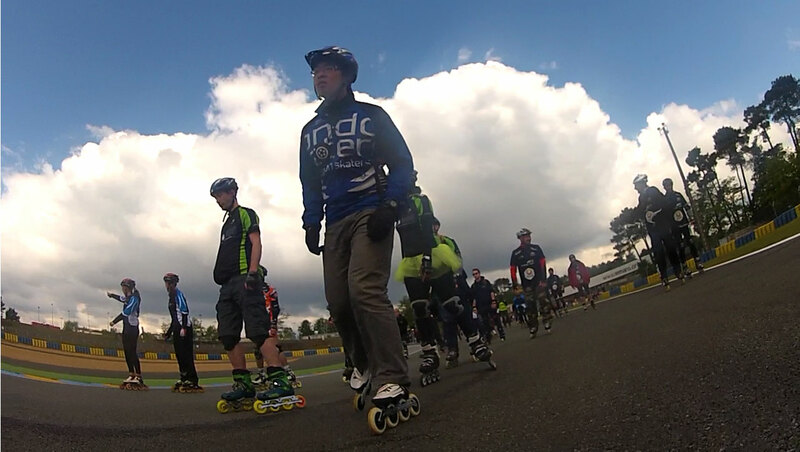 And I know that every year after my first lap I will swear I am never going to skate Le Mans again, but by the end of the race I am already thinking about how I can make it better next year. So how was it better this year than last? Well, first there was the chateau 15 minutes drive away that makes the Friday night so much better, and the lovely restaurant near the tram stop that we discovered while buying winter clothing at Decathlon. Then there was our space in the pit lane. Where last year we were relegated to 2 square metres as some other team members had decided to set up a baby change area in the pit lane, encroaching on our space, this year we had ample room for all our bags and an inflatable mattress. We used a different shift rotation that worked very nicely for everyone and made the whole event seem a little easier, and our t-shirts were a little bit nicer than last year’s. So what about next year? How can we make it better for our team? The answer is simple. Patio heaters. Photos from Jonathan Chen’s GoPro.